The measure of an invention is how quickly it is snatched from the inventor and bent to the will of society. The telegraph was created to signal trains, TV was invented as an educational medium, and the Internet was for scientific research. No matter what the will of the inventor, the will of society is stronger. We should be proud when our creations are redirected, as this means we did something bigger, more significant, and more general than we might have originally intended. But that doesn’t mean we should be blind to consequences. As Phillip Rogoway noted in The Moral Character of Cryptographic Work, all engineering is political, whether overtly or implicitly, and therefore it is also moral. It behooves us as inventors to consider the implications of our work; in Rogoway’s cryptography that means determining which problems matter equally to society and to journals. What you choose to work on is important, and the challenge of consequences remains: we just don’t know what the world will do with what we invent, no matter how well intentioned we are. Sometimes thoughtful design helps. Wikipedia, for example, evolved a governance model when the cacophony of random edits failed to create useful pages. For a glimpse into its past, look at Fernanda Viegas’ beautiful depictions of the progress of some of its pages (an example is at the top of this post). Occasionally the edit of choice was complete deletion. Facebook, on the other hand, is more of a reflection of us at the moment. Our foibles become our downfall. Jonathan Swift said in 1710 that lies travel faster than the truth and do their damage before they are corrected. When we make a platform that removes all friction and gives equal voice to propaganda, we are treading on dangerous turf. We all know the dangers of hitting the send button too quickly on inflammatory emails. 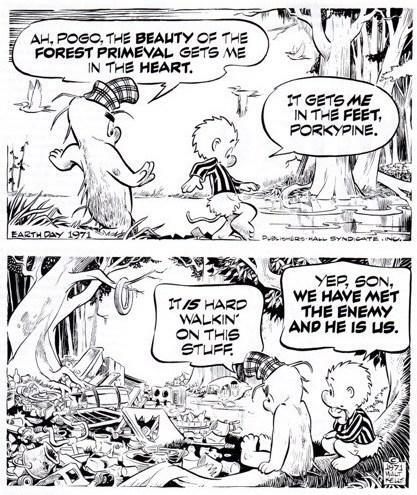 As Pogo said, “We have met the enemy and it is us.” We should create technologies that amplify our better nature but boy, is that hard! In our research group’s work on viral political action, we strive to do two things: find teachable moments when people are open to ideas, and figure out ways to engage people in the democratic process. The theory is that participation engenders consideration; the means are local, personal, social, and engaging. We use challenges, games, contributory canvases, and even facts. Mass advertising works, and so does targeting, as we know. But in the end, decisions are local and friends don’t let friends vote blindly. We are testing the notion that ideas take root locally, informally, and among friends. The theory is that participation engenders consideration; the means are local, personal, social, and engaging. Of course this may backfire. In the US, many people feel they are subject to the tyranny of the minority; the founders were more concerned about the tyranny of the majority. Mostly we just feel that those who disagree with us have the upper hand. Keeping people agitated may reinforce that. But we keep trying to create technology that opens minds; in Rogoway’s terms, reflection rather than agitation is the right problem to be working on. Society has worked in the past, it will do so again; our goal is that as it wrestles our inventions from our hands, they let our better nature prevail.